In this post, we’ll share with you our review of two of the top selling Hamilton Beach air purifiers. These two air cleaners are popular among consumers because they offer a convenient size that’s ideal for both home and office use. If you’re looking for a small, yet powerful air purifier that helps clean the air of harmful allergens and/or odors, these two products are worth a try. Depending on your needs for an air purifier will determine which of these Hamilton Beach products you should buy. 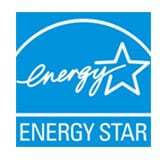 Take a look at our reviews below to discover which air cleaner is right for you. 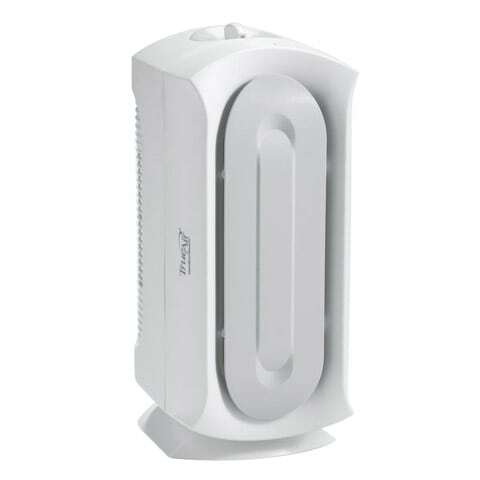 If your looking for a small air purifier that provides a lot of cleaning power against airborne allergens and other harmful particles, then the TrueAir Compact Air purifier is a great choice. This device is equipped with both a permanent pre-filter and HEPA-type filter which can be vacuumed clean. There’s no need to ever pay for a replacement. Also, these two filters work in conjunction to trap particles that are 2 microns in size and larger, which includes common allergens such as pollen, dust and hair. You also get the added convenience of reducing odors in the room through the use of two replaceable carbon filters. These filters are good at removing light smells produced by pets, cooking, chemical gases etc. 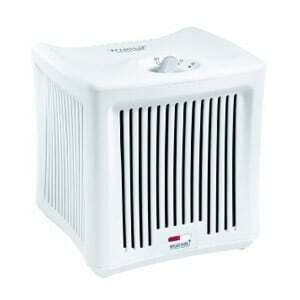 This air cleaner is rated to purify a space up to 140 square feet, which is great for small rooms and office areas. It also measures 10.8 (D) x 8.1 (W) x 16.4 (H) inches and can be positioned vertically or horizontally. We’d also like to point out that we feature this product as the best and most inexpensive air purifier for removing pet hair. If you have cats or dogs it’s definitely a worthy investment. It’s also featured on our top rated air purifiers list. It’s important to note that the odor reduction feature is secondary to the HEPA filtration and is not extremely powerful. If you want an air purifier that’s more effective against odors, take a look at the TrueAir Odor Eliminator review below. If you want an air purifier that’s designed to remove obtrusive odors and produce a fresh smelling room, the TrueAir Odor Eliminator is a top choice. This Hamilton Beach air purifier features three carbon filters and 270 degrees of air intake for maximum odor removal. It also features an optional scent cartridge for extra value. You won’t find a combination like this in any other similar air purifier on the market. The small compact design also allows it to fit practically anywhere. You can place it on a table top inside an office or kitchen, in the corner of a bedroom, or even in a bathroom. The dimensions are 7.966 (H) x 7.3 (W) x 3.74 (D) inches and it’s rated to purify a space up to 100 square feet. A final way in which this product stands out is the fact that it’s very inexpensive to operate. It uses less energy than a 15-watt light bulb, which allows you to let it continuously run without the fear of it drastically increasing your energy bill. The major difference between this product and the one reviewed above, is the fact that it’s geared toward odor reduction only. 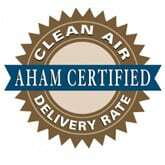 If you are not too worried about removing airborne allergens, this is a better option for you to try.